Hey there! I know it's been quieter on the blog lately. I was doing so well for a while. I was creating more, which meant that I had more to share. Then I got a new three month old baby in the daycare, and the ninth month old baby decided he would only sleep if I'm holding him. And that, my friends, is when my life apparently fell apart. Lol. Anyways. One of my little daycare girlies, Luna, had her last day with me this past Friday. I started watching her exactly three years and one week ago, when she was not quite nine months old. And now, just months away from turning four years old, she's moving on. Literally, as they are moving to another state. I had this idea to make her a little album, so that she could have some photos of her friends to remember them. I actually had the idea for a few weeks, but it wasn't until the night before her last day that I decided to actually throw something together. I had picked up a little 4x4" album from WRMK a few weeks ago, just in case I did decide to create the album. I knew that I didn't have a ton of photos, so I wanted something small. I also knew that I had a bunch of little 2x2" photos already printed that I could incorporate into this size album, with the little divided page protectors. I started the album with one of those divided page protectors. I had some crochet hearts from Bella Blvd sitting out, that I had torn off of other projects. Since they didn't have the adhesive tabs on the back anymore, they were easy to slip into the pockets. I then machine stitched along the openings to close each pocket up so the hearts don't fall out. I followed the opening page with the "lucky" 4x4" clear card that I found in my stash (from Heidi Swapp) and slipped into a full page protector. I honestly don't have many photos of Luna. One reason being that she was always part time, so she wasn't around every day. And one reason being that she didn't really like me to take her photo. But I did have this really cute one from when she was smaller, so it's the main 4x4" photo of her in the album. I included just two 4x4" journaling cards in the album, and wrote my journaling by hand on both. Mostly because it was quicker, as I would always prefer printed journaling for sure. I then printed out one 3x4" photo of each of the kiddos that have been her with her over the last three+ years. All of the 2x2" photos in this album were all phone photos that I had printed a while back thru the FreePrints app. I didn't have a plan for them at the time, so I just went thru the pile and tried to find two photos to go along with each of the kids. I don't take that many photos of the kids these days. Not like I used to years ago, when I would have tons of photos of them, month after month. Abby here was one kiddo that I just didn't have many photos of, as she moved on a while back to preschool, and is only here during the summer. So I just included some random photos next to her photo. When it came to filling the pockets without photos, I ended up turning to my Bella Blvd stash. While most of the collections do contain a few 2x2" cards that can be cut out from one of the patterned papers, some of the older collections had Candid Cards, which contained lots of smaller 2x2" cards to choose from. Most of the cards, I simply slipped in the pocket and that was it. There were a few cards that I did add an enamel heart too, because they were simpler cards that seemed to need a little something extra. Next to the 3x4" photos of the kids, I added a piece of star patterned paper. I actually cut 4x4" pieces of white cardstock for these pockets, and adhered both the photo and the patterned paper piece, and then machine stitched along the edge of the photo. I found a coordinating tab to go with each kid's photo, pulling them from the Paper Pieces from some older collections. I tucked those under the side of the photo before doing the machine stitching. I also added each child's name to their photo, using some alpha stickers. Easy peasy. This is a super simple album. Like I said, I threw it together in just about two hours, start to finish. I kept thinking I should add more, to bulk it up a bit. But in the end, I decided it was just enough and that Luna would love it. I snapped this photo of Luna, and three of the other kiddos that were here on her last day. These are the four older kids, and the ones she always played with the most. So it was nice that they were all together on her last day. I printed it out during their naptime, and slipped it in the last page of the album. Luna's mom said that Luna loves her album. She told me that she was trying to get a photo of it, but Luna wouldn't let go of it, and that she even slept with it Friday night. So cute. I'm really going to miss that girl. I finally finished a layout that has been in the works, in one way or another, for a full two weeks. Crazy how little I'm getting done these days, and that's not just referring to scrapbooking. 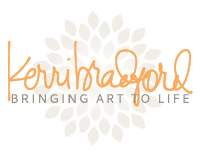 I've got this new layout up at Kerri Bradford Studio today. I mentioned this a few posts ago, but I recently re-organized some of my albums, and in the process I came across a handful of layouts that I pulled out with the intention of re-scrapping them. The original layouts were extremely bulky and took up a lot of space in my albums. While I don't feel the need to re-scrap each and every layout that has a little bulk to it, there were some that were just way too bulky for my taste now. 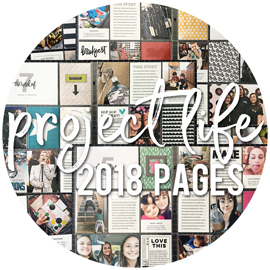 And quite honestly, with the massive amount of albums that I have accumulated from 22+ years of scrapbooking, I really like to be able to squeeze as many layouts into each album that I can. These photos of my girls, from 10 years ago when they were flower girls in my cousin's wedding, were on one of the layouts that I wanted to re-scrap. Well, not these exact photos, since my original layout was a two pager, with just three 4x6" photos. Anyways. 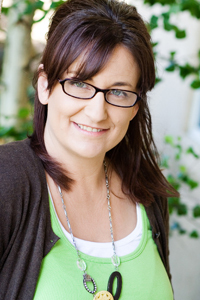 I was browsing thru Kerri's cut files and came across the floral piece from her Life Additions #2 kit. 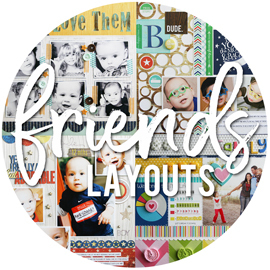 It could be sized as a 3x4" cut, and I knew it would be perfect for this layout, since I could print several of my photos in the same 3x4" size and collage them all together in my favorite style - a clean and linear grid design. I picked several patterned papers from Fancy Pants for this layout, and cut four of the floral pieces from three different papers. I picked out the word "beautiful" from Kerri's Something To Say kit, because - well, because I think my girls looked beautiful in their flower girl dresses and pinned up hair! The brown tone-on-tone striped patterned paper that I used for "beautiful" is also from Fancy Pants. I finished off my title with some simple white alpha stickers from Bella Blvd. I knew I wanted to keep this layout very simple and clean looking. I added a few brown enamel dots to the centers of the floral pieces for simple embellishing, and at the last minute, I added a few chipboard words that were out in the open and caught my eye. I didn't feel the need to add any journaling, since I do have another layout with additional photos of the girls with the other flower girls, and that layout has journaling on it. Overall, such a simple layout, so I'm still trying to figure out how it took me so long to get around to finishing. 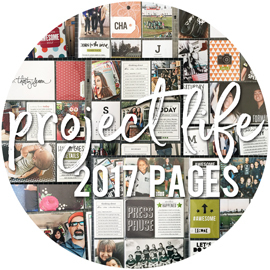 Yesterday was the first Monday of the month, which means that a new monthly project sheet went up on the Bella Blvd blog. 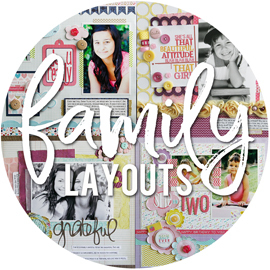 For this month's layout, I was asked to use the new Sweet Sweet Spring collection. I decided to go with some photos of the girls coloring easter eggs years ago, as I'm fairly certain I have never scrapped these before. I printed my photos as 2x4" pics, which isn't something I do very often. But I had the idea of doing four strips of patterned papers and photos across the center of the page, with an extra smaller strip of patterned paper mixed in, so the skinnier and taller photos were in order. I picked out several of the tone-on-tone patterned papers to use as the strips my photos would be on, and then picked one of the busier patterned papers to use on it's own. I also cut a strip of a aqua dotted clear cut transparency to layer over the aqua grid patterned paper, to give it a bit more interest. I added a few border strips along the top and bottom of the page. The yellow dotted border strip and the "happy easter" border strip, both along the bottom of the page, and a thin piece of the aqua dotted border strip along the top of the page. 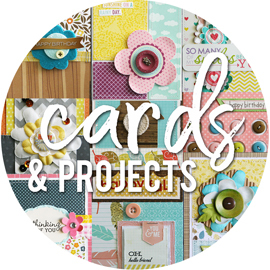 The new collections all come with newly designed Paper Pieces, which are filled with a variety of die cuts that are all ready to add to your projects. I knew I wanted to add several of them to the page, and pulled out the easter eggs, a few banner pieces, tabs, and flowers. I didn't have any of the chipboard to work with for this layout, and I wanted something a little larger to fill the upper left corner of the page, so I fussy cut the cute little tree from a 3x4" card on the Daily Details patterned paper. For the title, I used the purple alpha stickers from the Treasures & Text sticker sheet and some alphas from the Tiny Text alpha stickers. I went back and forth on what color to use for the "fun coloring" part of my title, and settled on navy blue, since there were touches of it in the busier patterned paper strip and my photos. I added several of the die cut flowers down my busier patterned paper strip, and added some enamel dots to the centers of several of the flowers, as well as sprinkling them around the rest of the page. You can download a copy of the March project sheet, complete with full supply list and detailed instructions, RIGHT HERE.